This afternoon, FC Barcelona had the great pleasure of welcoming to its ground one of its youngest penyas (supporters clubs). 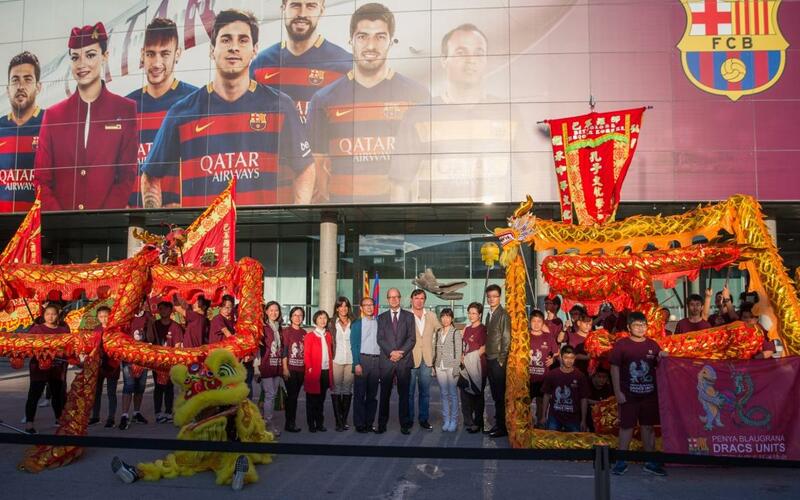 Formed last July, the Penya Barcelonista Dracs Units Xinesos pel Barça certainly made its presence felt on the Camp Nou forecourt, where FCB first vice-president Jordi Cardoner i Casaus was watching on as a traditional ‘lions and dragons’ dance was performed by pupils from the Escola Kongzi. The president of the penya, Zhuomin Ma; was also in attendance, along with its treasurer Lei Lei Ma; vice-presidents Sergi Gálvez, Pere Soler and Kimi Chen; general secretary, Pilar Calvo, and the president of the Barcelona East Federation, Jordi Monturiol. The celebrations concluded with a group photo and a visit to the Barça Museum, but there is more to come this Saturday at 11.00am CET, when the Penya Dracs Units will be inaugurating their brand new clubhouse at Sancho de Ávila, 80-86 in the Poblenou district of the city. Cardoner will be attending in the company former player Jose Mari Bakero and the Chinese consul to Barcelona, Tang Heng, among others. The club already has over 200 members from the local Chinese community many of whom work or study at the Escola Kogzi, a school that builds bridges between the Catalan and Chinese communities and, among other projects, offers classes in the Mandarin language.